December and March are huge birthday months for our families. This week both of our moms would have celebrated their birthdays. Rick's sister's birthday is this month, a couple of nieces, a great niece, a nephew, a good friend's.......see what I mean, birthdays o'plenty. Since our moms have died, I try to always place flowers on their graves in December, in remembrance of their birthdays as well as Christmas. Yesterday we bought red silk roses, baby's breath and red plaid ribbon.......I arranged their flowers last night, and placed them on their graves today. I suppose to some it would seem silly, that gesture of silk flowers......but it is the only thing I can do now for our moms.......a bouquet of Christmas roses. I have dreamed about my mom and dad a couple of times this week.......the dreams were so real and vivid.......I heard their voices, saw their faces. I thought that I was with them. I think it is because I have been sick this week......Rick is a great nurse.....but I miss the nurturing of my mom and dad. Tomorrow is the first day of December, this week is treatment #36. Tonight I pray blessings of peace, joy and good health for you all. Appreciation for the good days, gratitude for the good days.........meditation for every day.......and tolerance for the difficult days. Pity parties are allowed, but there is a time limit. Imagination with a dose of realization helps. The love of friends and family and pets is a daily need......wants must change from day to day. Being outdoors is a necessity.....a piece of dark chocolate is a pleasure. Cool water, fresh food, required.......no drama allowed. Do what you love, at least once a day. Don't be afraid to live......believe in yourself. One breath at a time, one day at a time.........love with all your heart, even when it hurts. Tears, just like laughter, heal......laugh out loud daily....cry when you need to. A hug, a smile........can change your world and someone else's. This my friends is my personal recipe for life.....feel free to throw in a pinch of this and that. Today was just what I needed.......friends, family, food and laughter. It has been a tough week, actually I have not worked because of the meningitis, but am so much better today. My heart overflows with gratitude tonight. I hope you all felt as much love and joy as I did today. I remind my classes almost every day, without gratitude, there is no joy. I often hear complaints from those around me about their lives, but I can promise you this......no matter how bad you think your story is, there is one which is worse. It is so easy to see the bad and close our eyes to the good......and there is good all around us. Tomorrow is Thanksgiving......my very most favorite holiday.....I love this day, because there are no expectations of gifts......just food and fellowship.....( and laughter if you are at our house). I hope that you live in the moment tomorrow, that you enjoy your meal, and the fellowship of your friends and family. If you go shopping, play nice with the other shoppers and those who are working.....and remember, once upon a time......this was a holiday, not a shopping day. Thank you all, for spending a few minutes of your time, reading my blog. I appreciate it. What I have called the "dreaded serum sickness" and what has now been defined by the new doc as aseptic meningitis hit about 3:30 this morning, it has been a bear. So, now I have missed two days of work am hoping like heck I get to go tomorrow. This is not how I had my Thanksgiving week planned......take a breath, a nap and work through it. Last year the stuff hit me on Thanksgiving morning, maybe it has run it's course for this week. Doesn't matter, life goes on, even when I am on the couch. And I am much better tonight. Plans are always subject to change.....that is life. Tomorrow is hump day......let's hope it is a tiny hump and we all skip right through it. It went well with the new doctor today......he confirmed the diagnosis, explained the aseptic meningitis I am having, was kind and compassionate, spent a good two and a half hours with me, and accepted me as a part of his study. I hope and pray that as a part of this study I help someone else. Yes, treatments will continue......#36 takes place next week. My transformation today........I received answers and hope......this transformation for me was major. I hope your Monday brought you answers and hope today, if it did......remember to be grateful....if not, find something to be grateful for anyway. I would be the first to admit I live a strange life........last Sunday night, we were on stage in Muscle Shoals performing......tonight, I have painted the guest bedroom. I have also spent the past hour filling out paper work for my doctor's visit tomorrow. This is a new doc, a research doctor actually who is an immunologist, pulmonary and rheumatoid specialist. I have waited months to see him, I am excited and a little apprehensive. I do know this, just his suggestions in the past couple of months have made a major difference in my life. For the first time since treatments began, I worked a whole month without having to take time off for sickness. Thanksgiving week........I try to make every day one of gratitude, and Thanksgiving is one of my most favorite holidays. I am so sorry that it is being turned into a shopping event. I spent 25 years in the retail industry, my belief is this.......if every Thanksgiving day/Black Friday shopper had to work retail those days......I bet it would all come to an end fast. I hope your Monday is un-eventful.....no traffic, no stress, no worry.......actually, I hope that for the whole week. If holy water- the rivers, lakes and oceans? Spent the day buying food for our Thanksgiving lunch. Saw some old friends and enjoyed an incredible blue sky and warm sunshine. Will be in the 70's by Sunday and now the weather guys are saying we may have a few snow flurries on Thanksgiving ........wow, Alabama weather, gotta love it. Calliou just came in to say hello, he has been outside and smells of woodsy smoke. His fur is so soft, he is like a 90 pound teddy bear......he thinks he is the size of Taz, who weighs about 6 pounds. He is forever wanting to sit in my lap. He doesn't want me on the computer, he wants to play......he is now speaking in Collie grunts. I think, Calliou is winning this battle tonight, time to pet him and get ready for bed. Wishing you all a Saturday that is fun and worry free. Calliou has grunted in agreement. Success for me depends on what I am doing at the time.......if it is music, success is singing the song and having someone come up afterwards and tell me how much that moment meant to them. Maybe it transported them to a memory or place, or just resonated with them, that is one success for me. That's why I write songs and sing. Teaching success varies too......today was an extremely successful day. I had students who are new this week, with PTSD.......when I start savasana or relaxation at the end of class I always watch my students, making sure they are comfortable. For the past couple of days, I knew these guys were struggling, white knuckled struggling, every muscle in their body tense. Today, I watched as the knuckles unwhitened, muscles softened, breath slowed........they were relaxed......SUCCESS! As they left my room, there were smiles and many thanks. This is why I teach. When I was younger, I thought success would be.....my songs on the radio, being famous, etc. It is interesting how time changes everything, how values change, what becomes important. Sunday night, I was a very successful singer/songwriter......today, I was a very successful yoga teacher. Class is completed, certificate earned ( with distinction) and ready for the next one. I had forgotten how much I loved to learn and study. Though I do get a little crazy with tests. But I have been reading about health and nutrition for over 40 years and the thing that thrills me the most, my niece Samantha ( Jordan's mom) has acquired that interest also. I have always known it in my gut, but as the years have gone by, the more I have studied and learned, I found out that if we want the best health we can have.......we have to participate, we have to often take matters into our own hands, and figure out what is best for us. We cannot rely on others to have our best interests at heart. ( in life, health, career or anything else) Blind trust in the medical profession does not get you the best care. My transformation, fueled by a chronic illness, has been one of hard work, persistent digging, always questioning, and searching for answers. We can not be satisfied with the status quo, not when it comes to our health, nutrition and lifestyle. Don't be afraid to question, and never let someone rob you of your hope. It ain't over until the last breath is drawn. I still believe that we can create more than one blue zone in this country. I often do a meditation at the end of my classes where I talk about finding your space, a place where you feel peaceful and safe. It is yours alone, no one else can go there. When the world is spinning out of control, you can find yourself in your sacred place, you can find peace, and direction and answers there as well. It is a simple place to find, you close your eyes, focus on your breath and think of a place where you feel safe and peaceful. It can be a real place or one you dream of,but it is yours alone and the authentic you is always there, waiting for you. The holidays are upon us, I am already seeing the stress on faces and hearing it in voices. It is easy to lose yourself in the maddening crowd and the push to overspend, over eat, over drink, over work and over do everything else that we do to create a holiday experience that exists mostly in our imaginations. Before you tumble down the slide of fake snow and forced gaiety, find five minutes.......( even if you find them in the bathroom) close your eyes, breathe slowly, and imagine being alone in the most peaceful place in the world. Let your pulse slow, your breathing become even, and notice all the details of your sacred place.......the colors, the sounds, the smells, the textures of everything around you....it is your place, your space and when your find yourself getting lost......go there. A polar blast has hit today, record lows tonight and tomorrow. Weather guys are saying we will break a hundred year old record.......it is chilly willy. I hope where ever you are tonight, you stay warm and cozy. I am still a little tired from the gig and then teaching today. An ol' cold rainy day.......any other time, it would have been the perfect day to stay home, sit in front of the fireplace and drink hot cider and play with the dogs. But today was a road day, a gig had been booked for some time......a good gig, in a musician's mecca......Muscle Shoals. We had a great time, our host, Max was an awesome singer/songwriter, an audience eager to hear our songs was the icing on the cake. I had worried after yesterday, that the serum sickness might try to rob me of this gig.........thankfully it did not. We had a did good, as our friend John use to say, we had fun as our friend Stevie use to advise.......but now, time to get some rest and listen to the rain. Humor.....some days it is the only thing that gets you through with a chronic illness. The serum sickness hit out of the blue this morning on the way to the grocery store. As sick as I was, I couldn't help but laugh.......how many people do you know who carry a barf bag in their purse, yoga bag, car or husband's lap top case? I am better tonight, but serum sickness is so sneaky, hits out of the blue, when you least expect it. We have a wonderful gig tomorrow night. We will be playing the Shoals Songwriter's in the Round, at Muscle Shoals. This is our first gig in the Shoals area, the musical history of the Shoals is so rich.....it's like playing Carnegie Hall! Hope your Saturday has been a good one.....may your Sunday bring peace, no worries, and great joy. We visited our friends Charlie and Yvonne today........they are older and Charlie's health is not great, but they are a joy to spend time with. Charlie was a press secretary for a congressman for many years. Yes, he does have some stories and none of them are boring. Yvonne is charming and witty and they still host a live local tv show. I sat and listened to them today and marveled at the life they have shared. If Rick and I make it to our 80's I hope that we are still that vibrant and interesting. On one of our visits awhile back, Yvonne gave me a gold bangle bracelet that Charlie had given her when they were in DC. It is one of my most treasured possessions, I wear it often. I think of her and Charlie and what their lives must have been like in their younger days . As we were leaving today, Charlie said something so poignant......he was telling us how much they loved our visits......and then his voice changed.......he told us that one of the things about growing older, that people did not visit you as they did when you were younger. There was such a wistfulness in his voice. It is sad that our culture does not celebrate age and the wisdom and knowledge that comes with it. spending time with those who are older, shame on you. Their lives, their experience and passions are vital and important and you my friend, are missing out on so very much. Everyone has a story, and those who have lived a long life.......have many stories to tell. Yesterday it was 78 degrees here with blue skies and sunshine......today it was in the 40's, cloudy, windy and cold......the s word is being discussed by the weather guys for Sunday and Monday. Just flurries, but for Alabama in November......it is a big deal. We skipped most of fall and dove head first into winter. I am getting excited about Thanksgiving.......just like last year, I am cooking lunch for friends who have no place to go, for family members who want to come. We had such a good time last year, even though the serum sickness hit and my niece Jayna had to come and help me cook. Hopefully that part will not recur......keeping my fingers crossed. We have a really good gig this weekend, The Shoals Songwriter's Showcase on Sunday night and yes, it is in Muscle Shoals. We have been practicing like crazy. I don't teach on Wednesdays. It's my day to let my body rest, play catch up on house duties and just hang. It is the perfect hump day. Where did this week go? I hope your hump day was as good as mine. Enjoy your Thursday......remember to do something kind for yourself and someone else. I tear up often on Veteran's Day.......I cry for my dad, who could not speak about WWII at all, I cry for all those Veterans through the years who left families and friends to serve their country. I cry for those who didn't make it home and for their families. I cry for those who did come home, for the memories they can't erase, the guilt they carry,the nights they don't sleep and the pain that will be with them forever. I cry because the words Thank You seem so small and insignificant to someone who is willing to give their life for me and this country..........yet no other words come close. We watched the Walter Mitty movie tonight with Ben Stiller.......I know, it has been around awhile, but I have never been a big Ben Stiller fan and well, you know how that goes. For some reason it seemed like the movie to watch tonight......so glad we did. It was the best thing I have ever seen Ben Stiller do, a wonderful adaptation of the story......a really beautiful funny film. Shawn Penn as a Life photographer was awesome. I haven't taught a class since Tuesday, so glad to be going back to work tomorrow. My energy is back to normal today, a few moments of serum sickness, but so far nothing bad. Keeping my fingers crossed. Already the second week of November, last week as I drove home from work I saw houses already decorated for Christmas........I'm thinking did we do away with Thanksgiving? and radio stations playing Christmas music......this is beginning to feel like a Twilight movie, jumping from Halloween to Christmas. I suppose there is just not that much money to be made on turkey and the fixin's. I am sure there is a hefty profit in Halloween costumes and candy and decorations and then of course, Christmas brings a spending frenzy. It seems the only emphasis on Thanksgiving anymore, is the Black Friday that follows it. How sad is that. Wow, I fell down the rabbit hole......but Christmas decorations the first of November tend to push my buttons. Wishing you all a happy work week, enjoy your Monday.....may the traffic gods be with you. Cabin fever hit this morning........I had not left the house since coming back from treatment on Wednesday. We did an early morning trip to grocery store......then it was nap time. The highlight of my day........we picked a few of the remaining apples off the big tree and I made an apple pie this evening. Today, my life in the fast lane would have made a turtle laugh. I am reading the book, The Blue Zones by National Geographic writer, Dan Buettner. Pretty interesting stuff, about the areas of the world where people live the longest and are healthy. Since my philosophy is quality of life, not quantity, this book has been most interesting. There is a Blue Zone in California, Costa Rica,Sardinia, and of course the most famous one, Okinawa. There are several common threads in these communities, the people are active, eat lots of fruits and vegetables,nuts, and beans, drink lots of water, have a strong sense of family and community, spend time outdoors, limited intake of meat, little or no processed food. It is an easy interesting read.....if you are interested in your health it makes sense to adopt these habits that are found in the "blue zones." There is nothing complicated about the lifestyle of these people, actually much of it comes down to common sense and moderation. Living to be 100, still active, and in good health is appealing, and it can be done. Wouldn't it be great if every state in our country had a blue zone? Transformation comes in surprising ways......yesterday was difficult.... the day after treatment, physically and mentally out of sync. I call those days lost.......and sometimes it makes me angry at myself that for the past three years I have experienced so many of them. Around 4:30 yesterday afternoon the phone rang, I recognized the number as a local florist in Sumiton. 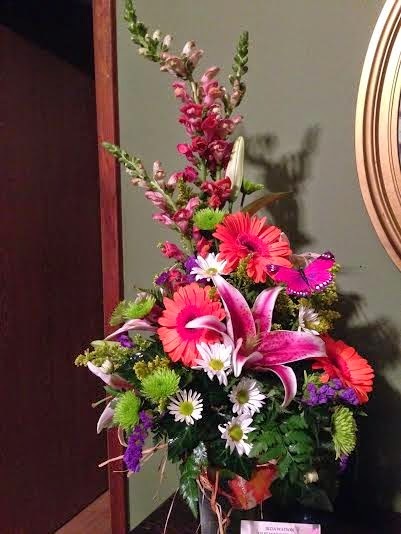 The sweet young woman calling, said they had a delivery for me and asked if I would be home for awhile.......about an hour later, a knock on the door and there was the most beautiful vase of flowers. I could not imagine who had sent them and quickly took a look at the card. So the pity party ended, and I reminded myself of how much I had to be grateful for.......I will never forget their kindness and love. A full moon tonight.....I often write about the beauty of a full moon, there is nothing like it. But I also love the fact that knowing the full moon shines on all of us, there is a connection, much bigger than the blogging world. We are all illuminated by the light of the moon, adorned by its brilliance and humbled by its majesty. I love to think about the power the moon has, its pull on earth and its tides. I truly understand how tribes worshiped the moon, stars and sun........the power of light and darkness, of warmth and cold. So where ever you are tonight, enjoy the beauty and magic of the moon.....may we never take its light for granted. Treatment #35 today........the infusion room was not so busy today and for the first time in many months, there seemed to be no sadness nor tears. All day you could hear chatter and laughter, even the nurses seemed to be less stressed. As always, my friend Louis was there speaking to everyone in the room......he calls me the queen of the infusion room, but trust me, he holds court and it is his kingdom the moment he walks in. I always sit in the same big green chair, he tells everyone it is my throne. The nurses talked about how long they had been at the infusion center, one has been there since before her son was born ( and has known Louis the whole time). Her son is a freshman at Auburn University now. There are bonds and friendships formed by those drips and big green chairs, I know.....the nurses seem like family now. A full moon tomorrow night, and there was a ring around it last night when I drove home from work. I have said it before, but there is just something special about the night sky in the fall and winter and the sunsets are much more colorful. This weekend we will do a gratitude ceremony, there is much to be grateful for at the Watson house. What a difference twenty four hours can make. Yesterday morning I had gotten up, went through my morning routine and as I was making myself a sandwich for lunch, the serum sickness hit. Rick was in Birmingham, my brother Ricky ( who lives next door) was at work, I was home alone. I took my meds and thought I will be fine.....but it progressed, so I took more meds. I called Rick just to let him know I was sick and ask that he call my workplace and let them know I couldn't make it. Lying on the sofa, ice pack at the back of my head, waiting for the nausea meds to work......hope deserted me. Rarely in my life, have I ever lost hope but I did yesterday. I lay on the sofa, Taz at my feet, Calliou on the floor beside me......and sobbed. Finally the meds kicked in, and I slept for a few hours.....by 7:00 last night I was able to teach my community class. I so glad I made it......I had a packed house, students that had not been in a while, and an old friend showed up. I felt their love and concern. This morning, I told myself it was a new day and that no matter what, I had to go on. Just before lunch, my phone rang.......it was the call that I had been waiting for......a doctor who specializes in my disease had kept me on his waiting list for a couple of months, his nurse called to tell me he could see me in February......I swallowed hard and expressed my gratitude for the appointment and reminded her that if any cancellations came up to please call me. In about thirty minutes the phone rang again.....it was the nurse......someone had just called and cancelled their appointment for November 24, because it was Thanksgiving week. She asked if I wanted it.......I choked up and told her that if he wanted me to come Thanksgiving day I would. Twenty four hours after losing hope.......I found it again. I have expressed my gratitude over and over today to anyone who would listen. So that was my transformation......tonight if you have lost your hope, please don't give up......it's waiting for you, just around the corner. Tomorrow is treatment day and for the first time in a couple of years, I don't dread it.......I have hope. The flannel sheets went on the bed today........I can't wait to snuggle in tonight. This morning I could smell the smoke in the firepit from our fire last night.......it really is autumn. This weekend has been like so many others......I pick and choose where my energy goes. Yesterday, we did a weenie roast and hayride for Jordan and our other great nieces and nephews. Ten kids, 12 and under.......the backyard was an amazing place, full of activity and laughter. They all arrived around 3:00pm, my energy left around 5:00pm, and I am still looking for it today. But, it was quite a bit of fun. I love the fact that kids want to come to our house.....and even better, they don't want to leave. I learned this art from my parents, our house was the house that all my friends wanted to come to. My friend, Debbie told me, she remembers coming to my parent's house when we were in high school during the Christmas holidays......my mom and I were making candy. Debbie told me, she had never felt so much love. One of Jordan's class mates and her mom came yesterday......her mom asked if it was a birthday party or something special. I laughed and told her, we did things like this often.....no reason, just food and fun. I have come to realize that when I am gone, all that will be left of me are the memories that others carry in their hearts........when it is time for me to go, I want to leave good memories......the kind that my family and friends will hold in their hearts forever.